Generally these are trips on which children of at least four years can be taken. However, if you do intend to bring along children under 12, please let us know in advance. Want to attend the famous NAADAM FESTIVAL in Ulaanbaatar? Look for our July departure below, or submit an inquiry for Naadam trip details. You could either choose to join one of our scheduled departures, or have us arrange your own private departure at dates best fits you. A sampling of the best Mongolia has to offer for visitors in one trip, this 13 day tour will take you through the northern edge of the Gobi Desert, the ancient capital of the Mongol Empire at Karakorum, hot springs, volcanoes, rivers and lakes. Along the way you will have the chance to meet different ethnic groups and learn about ancient traditions and about the lifestyle of the nomads roaming the vast Mongol steppes. Arriving in Ulaanbaatar, the Mongolian capital city, we meet our guide at the airport and head to the city center. The short drive passes through the shanty town inhabited by those who were once nomads, but have neglected their traditional lifestyle in the hope of finding a little fortune in the city, which not too long ago has seen some rapid development. The urban landscape quickly changes into expansive shopping malls and brand new residential complexes, shifting again to the scenes of the city center, where modern high-rises are quickly built amidst soviet-era buildings. After checking into our hotel, and if time permits, we will have an orientation tour of the city center through the central square. Right at the heart of the square we see the figure of D. Sukhbaatar, one of the heroes of the communist revolution of 1920’s, boldly raising his arm towards the statue of Chinggis Khan, the nation’s forefather whose name wasn’t allowed to be mentioned during the 70 year communist reign. We then visit the National History Museum, which holds a permanent exhibition on the different civilizations that have inhabited the territory of Mongolia from prehistoric times to the present. This exhibition includes a significant display of objects from the era of the Great Mongol Empire. From here we take a short walk to the drama theater where we attend an impressive folk concert, featuring some traditional Mongolian art forms. After a welcome dinner, we drive back to our hotel for a good night’s sleep. Today we drive back in time, to a place that recreates the lives of Mongolian nomads at the beginning of the 20th century. This was when Mongolia gained its independence from the Qing Dynasty and established itself as a reemerging nation under a living god-king. Here we shall attend a demonstration of how the nomads lived their lives during this era, and learn about some traditions that are carried on to this very day. After lunch in the camp we arrive at Khustaiin Nuruu Strictly Protected Area (SPA). The SPA was established as part of a unique project to reintroduce the world’s last surviving wild horses back to their natural environment. On the brink of extinction during the last century, only a very few Takhi or Przewalski’s horses were left in zoos around Europe. This graceful steppe horse was returned to Mongolia, and today, thanks to this special project, two herds again roam the Mongolian steppes. Overnight in a ger camp- the cozy yet simple, Mongolian version of a lodge, consisting of traditional felt-made dwellings the nomads of Central Asia often refer to as yurt. Leaving Khustai Nuruu, we take the approximately 4-hour drive west to the Elsiin Tasarkai sand dune. Marking the northern edge of the great Gobi Desert, Elsiin Tasarkhai stretches over 130 km north into the heart of Central Mongolia. We take a hike for a marvelous view over the dune, that seems as if it’s locked between two mighty mountain ranges. After lunch we continue our journey for another one hour drive. Built by Ghengis Khan about 800 years ago, Kharkhorin, better known as Karakorum, was famed throughout Asia as the capital of the Mongol Empire. Within the walls of this spectacular city, kings were chosen, laws made, and the fate of the next city to be conquered were determined. We will visit the ruins of the old city, the Erdene Zuu monastery, and other historical monuments in the area for as long as time, and daylight permits. Overnight in a ger camp. From the Khangai Mountain Range the Orkhon River runs all the way to Lake Baikal in Siberia. A UNESCO World Heritage Cultural Landscape, the valley has been at the center of several kingdoms and empires that have ruled much of Central Asia. The UNESCO committee states: “Collectively the remains in the site reflect the symbiotic links between nomadic, pastoral societies and their administrative and religious centres, and the importance of the Orkhon valley in the history of central Asia.” (UNESCO website). Today we head south, driving along the river valley. Our first stop will be for a three and a half hour trek (with the first hour uphill) to Tuvkhon Monastery, established during the 1650’s by Zanbazar, one of Mongolia’s most respected religious leaders. The monastery’s wooden buildings are integrated with a natural system of caves perched near a hilltop, offering beautiful views of the Orkhon Valley and the surrounding pine forests. With its unique natural features, the monastery was a perfect location for the great religious leader to meditate. Continuing south; we reach a beautiful viewing point over the Orkhon River canyon, where we stop for the night. Leaving our camp, we take an hour's drive to the beautiful volcanic canyon through which the Orkhon River flows. Here we will take an easy hike along the canyon floor, and end up at the pool at the bottom of the Red Waterfall. For the brave of heart, a cool swim awaits! From here we go on to the region the Mongolians call the ‘paradise of the horse herders’ due to its lush grasses and open valleys. We drive through thick pine forests to the Tsenkher hot springs, where water flows out of the ground at about 80°C (176°F), and where we can enjoy a relaxing soak. Overnight in a ger camp by the hot springs. Today we will take a short drive to the trailhead, where we begin our day’s hike. The hike is a truly enchanting walk up a stream where we hop from one boulder to another to the top of a hill, for an amazing view of the surrounding valleys. In this part of Arkhangai the wildflowers are plentiful, and it is likely we will see families cutting hay for winter fodder for their animals. From here we hike back down through a thick pine forest to our vehicle, and then take the return drive back to camp, where we enjoy another night of soaking in the hot water pools. Overnight in the same ger camp for a second night. Driving out of the hot springs, we pass through Tsetserleg, the provincial capital, where we make a short visit to the local market (closed on Sundays). We then visit the provincial museum, located in an ancient monastery (closed on Sundays as well). Back in the days when Mongolia was ruled by a religious figure, the monastery served as the palace for the local head monk, who served as head of the provincial administration on behalf of the king. Continuing west, we pause by Taikhar Chuluu, a massive rock which is connected to local mythology. In the afternoon we arrive at the hundred-branches-tree. Despite the fact this strange-looking tree has been burnt in recent years during shamanic ceremony, the site still is considered holy, and is worshipped by local people. From here we take a short walk to a good observation point for the Chuluut Canyon. Another one-hour drive brings us to our camp, nestled by a crystal clear river, where we spend the night. We spend this day hiking to the top of Khorgo Volcano, for a view over its perfect crater. From here we also enjoy a view over the vast lava fields that dominate the surrounding landscapes. Reaching the top of the volcano we continue our hike through basalt fields studded with pine trees. En route we stop at the Yellow Dog Cave, an interesting volcanic phenomenon, and we then end our hike at a pilgrimage site on the shores of Terkhiin Tsagaan Lake. Late in the afternoon we drive north on one of Mongolia's most beautiful routes, as we cross high mountain passes, vast grasslands, and small creeks. 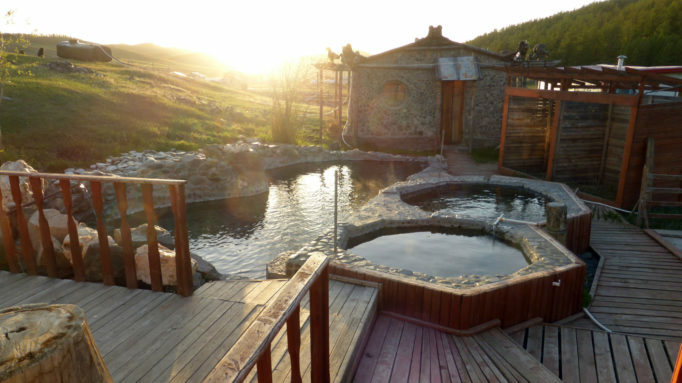 We end the day at Jargalant Hot Springs in the mountainous region of Khovsgol, where we spend the night in a ger camp by the hot springs. As we head north, we pass through the town of Murun, the provincial capital of Khovsgol. A short while later we arrive at an ancient burial site, featuring Mongolia’s mysterious deerstones. These memorial stones represent important leaders and warriors, carved with deer motifs. After visiting the site, we continue our trip northwards. One of the world's largest fresh water sources, Lake Khovsgol and its amazing surroundings are home to several of Mongolia’s ethnic minorities, among them are the Tsaatan, or better known as the reindeer people. The protected area surrounding the lake is a refuge for a wide variety of wildlife. We arrive at the lake’s shores late in the evening, and check in our ger camp for the night. Today we take a horseback riding trip through the forests and meadows near the lake. Lying around 1650 meters (5413 feet) above sea level, and surrounded by mountains that rise over 3100 meters (10170 feet), the waters of Khovsgol are deep and spectacularly clear and pure. We will ride through thick pine forests carpeted with flowers, and explore the setting of Mongolia’s ‘Blue Pearl’. Overnight in the same ger camp by the lake’s shore. After an early breakfast in our camp, we drive back to Murun, taking the first available flight to Ulaanbaatar. Upon arrival, we meet our driver and guide, and embark on the one and a half hour drive to Gorki-Terelj National Park. The park features unique rock formations, scenic valleys, a winding river, and restful groves of trees. Many nomads live in the park itself, where they find good grazing for their animals. If time permits, we will take a short hike to a nearby hill, from where we watch the sun set over the park (weather permitting of course). We will spend the night in a ger camp in the park. This morning we take an easy hike to the famous Turtle Rock, a symbol of wisdom and longevity to the Mongolian people. We then continue hiking to Ariabal Temple. The temple has been recently reconstructed, after the original temple had been destroyed during the communist purges of the 1930’s. A site of great tranquility, it functions today as a meditation center to Buddhist monks. After lunch, we leave the park and drive to the newly constructed Ghengis Khan Monument. Rising 40 meters in height over the surrounding steppes, this mighty structure plays a major symbol to the renewing Mongolian nation, after more than 300 years of foreign sovereignty over its people and territory. We then head to the Mongolian Capital, where we will enjoy a farewell dinner, followed by a visit to the Zaisan Hill, for a view over the city at night. Overnight in Ulaanbaatar. 14 days extended trip including the Naadam Festival events in Ulaanbaatar! Many thanks to Mongolian ways for organizing a perfect trip for our family. We traveled with our 2 girls ( 7&9 years old) to beautiful Mongolia and had an amazing journey . Everything was well organized! We had a very talented and knowledgeable guide who was getting along with the kids perfectly, and a very skilled driver that made us feel safe. Everything was just perfect  and we couldn't ask for anything more. Thank you so much for the interesting and amazing experience ! !